Robotic Process Automation (RPA) is an increasingly hot topic in the digital enterprise. Implementing software robots to perform routine business processes and eliminate inefficiencies is an attractive proposition for IT and business leaders. And providers of traditional IT and business process outsourcing facing potential loss of business to bots are themselves investing in these automation capabilities as well. While the basic benefits of RPA are relatively straightforward, however, these emerging business process automation tools could also serve as en entry point for incorporating cognitive computing capabilities into the enterprise, says David Schatsky managing director with Deloitte. By injecting RPA with cognitive computing power, companies can supercharge their automation efforts, says Schatsky, who analyzes the implications of emerging technology and other business trends. By combining RPA with cognitive technologies such as machine learning, speech recognition, and natural language processing, companies can automate higher-order tasks that in the past required the perceptual and judgment capabilities of humans. Some leading RPA vendors are already combining forces with cognitive computing vendors. Blue Prism, for example, is working with IBM’s Watson team to bring cognitive capabilities to clients. And a recent Forrester report on RPA best practices advised companies to design their software robot systems to integrate with cognitive platforms. CIO.com talked to Schatsky about RPA adoption rates, the budding relationship between software robots and cognitive systems, the likelihood that the combination of the two will replace traditional outsourcing, and the three steps companies should take before implementing RPA on a wider scale. CIO.com: Where are most companies in terms of their adoption of RPA? David Schatsky, managing director, Deloitte: RPA is a new topic to some and a well understood one to others. More and more IT leaders have heard of the term and at least know what it is in principle. Adoption thus far is pretty modest. RPA has been more widely adopted in Europe and Asia than it has been in the U.S. And even those companies in the U.S. that have adopted RPA are typically just piloting it. CIO.com: Why did RPA catch on more rapidly in Asia and Europe? Schatsky:That’s due to the level of business process outsourcing that has taken place there. Asia is the hope of business process outsourcing and European companies have been eager to cut the costs of onshore operation using RPA. Also, one of the leading RPA companies, Blue Prism, is based in Europe. CIO.com: Why are you focusing on the potential combination of RPA and cognitive computing systems in particular? Schatsky: I think it will help to broaden the application of RPA and increase the value it delivers to the companies that adopt it. Cognitive technology is progressing rapidly, but many companies don’t have a clear path to taking advantage of these technologies. They’re not sure how and where to put them to use. RPA is a platform that can provide clear use cases for applying cognitive capabilities. Companies can install it to automate processes and it provides a framework or platform to integrate with cognitive systems to take automation to the next level. It’s almost the ‘killer app’ for cognitive computing. RPA is very useful technology, but it’s not terribly intelligent technology. It only performs tasks with clear-cut rules. You can’t substitute RPA for human judgment. It can’t perform rudimentary tasks that require perceptual skills, like locating a price or purchase order number in a document. It can identify a happy customer versus an unhappy customer. Cognitive takes the sphere of automation that RPA can handle and broadens it. CIO.com: Where will be the most beneficial use cases for using RPA in conjunction with cognitive technology? Schatsky: A lot of them are in the front office: classifying customer issues and routing them to the right person, deciding what issues need to be escalated, extracting information from written communication. CIO.com: Who tends to lead these RPA efforts—an IT leader or a business process owner? Schatsky: It’s mixed. Sometimes it’s led by the process owner in the business. They learn about RPA and identify an opportunity to deploy it and improve efficiency. In other cases, IT has been leading the effort. It’s indicative of the broader trend of tech-centric decision being made increasingly in the business and not just IT. However, it’s a classic example of technology that benefits from the involvement of both IT and the business. The business is accountable for the business process operation, but IT is responsible for things like security, compliance and governance. If the business goes out and deploys this stuff without IT’s involvement, those issues can get overlooked. 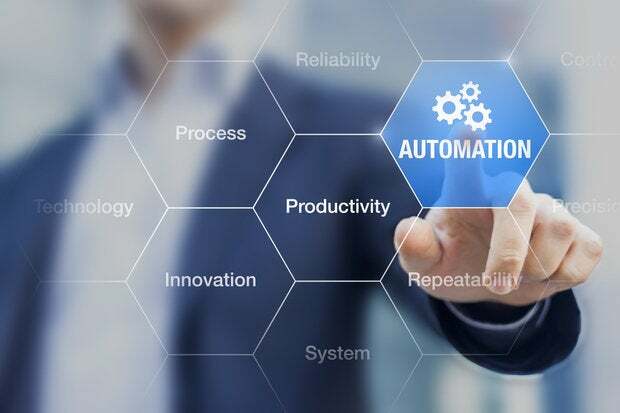 CIO.com: Is there much adoption of RPA to automate processes within the IT function? Schatsky: There’s plenty of potential there is in terms of automation routine IT tasks such as password resets. But RPA has come onto the scene really focused on business processes rather than IT. CIO.com: Will RPA, particularly infused with cognitive capabilities, displace the outsourcing of business and IT processes? Schatsky: It certainly raises the question of whether its possible to do away with outsourcing by automating functions. We’ve seen some studies that suggest that it an onshore process automated with RPA could be less costly than offshore process performed by humans. But the jury is still out regarding what the impact is going to be on outsourcing.